We are currently enjoying our fifth Christmas seasonal festivities in Ascoli Piceno, Italy. The very long and complex history of Christianity in European culture gives the holiday season, particularly here in Italy, a nuanced experience of great depth. Although Christianity may not have the contemporary, fervent commitment it may have once enjoyed, Italians are never-the-less steeped in the traditions of community participation in rituals celebrating the seasonal cycles. Participation in community observances is a means to express and reinforce a sense of identity and solidarity. Even the most cynical and committed secularist will be seen mingling in the holiday decorated piazzas. With each year we have been here, the inevitable, gradual increase in holiday commercialism becomes more apparent. Retail displays seem to start appearing earlier each year but nowhere near to the extent that they do in the U.S. But the economic situation here in Italy, as in much of the world, tends to dampen excessive consumption exuberance. Even more significant, when comparing our former lives in the U.S., holidays here are still strongly associated with family bonding augmented by enthusiastic socializing with friends. Italian gregariousness is never too far under the surface any time of the year but special holiday observances seem to add steroids to the mix. The more outwardly expressive nature of the Italian personality seems to add more depth to interpersonal connectivity. The traditional physical embrace with the kiss on each cheek (right-to-left here in Italy by the way) makes it difficult to not sense the presence of someone else. As we have commented on many times, an aspect of our transition into retirement has been a gradual adjustment away from material accumulation to more one of savoring experience. We are at a point where our pre-Christmas experience is no longer dominated in a frenetic, buying preoccupation. We may be establishing a pre-Christmas tradition for ourselves by going somewhere just after the official start of the Christmas observance with the Feast of the Immaculate Conception on the 8th of December. We want to experience the festive decorations elsewhere and then return to Ascoli in time to participate in the community events here and to join in the round of dinners and small social gatherings in the homes of our new friends. This year, we just returned from a very enjoyable four-day visit to Verona. From Ascoli, it is an easy journey by train. We chose a hotel in the center of the historical area and had relaxed walking access to much that was going on. 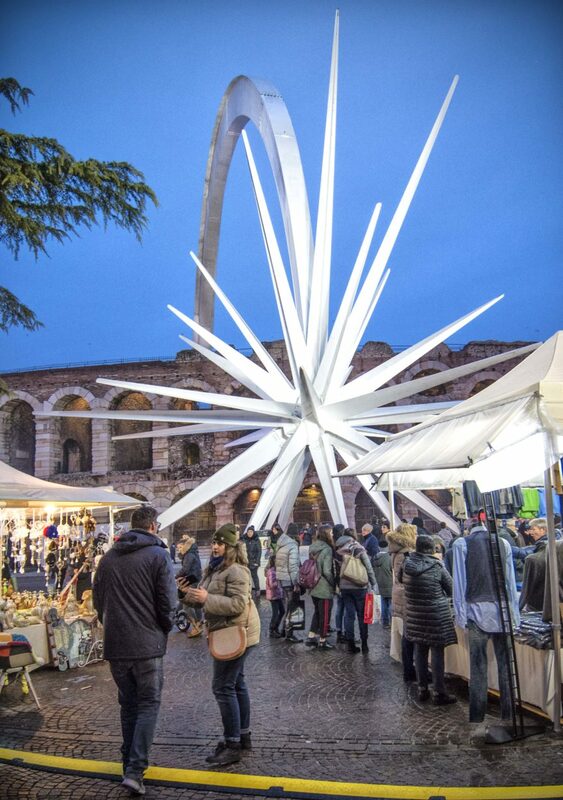 Several piazzas were filled with festive holiday markets (as seen in the image of Verona above). The major thoroughfares were brightly and tastefully decorated. We enjoyed excellent dining near our hotel. Among the advantages of being an Expatriate in Italy is the ability to be able to visit cultural sites outside the heavier tourist seasons. For example, we spent time in the exceptional Basilica of Saint Zeno in Verona when there were few other people there. It provided an opportunity to sit in quiet contemplation of this very special place with a very long history and attempt to feel connected with the generations of people who have come there before us, many as devout believers. We could quietly stand and admire ancient frescos in wonderful condition, many adorned with graffiti left by devout pilgrims some dating to 1390. The fast pace of the modern world, the increasing difficulty in understanding what the pace of change brings and our growing separation from each other with our fixation with our iPhones only seems to isolate us more and more from each other. And deliberate, politically motivated polarization doesn’t help. So, for us, experiencing a place where connectivity is something important enough to make some effort to sustain, is adding a great deal to our lives. We are still in the process of attempting to come to terms with the untimely death of Arlene’s younger sister earlier this Fall which still leaves an unfillable void. By this stage of life, the reality of the passing of others we have cared about becomes an increasing reality with which we have to cope. We recently attended the funeral of a warm and generous Italian friend who was taken much too early by cancer. The critical message in all of this is to not let modern life distract us from the more important reason we are all here – to care about each other. Once we cut through the complexities of variations in dogma and institutional rituals by which we indicate our tribal affiliations, most all of the world’s religions attempt to set forth an encouragement to have us care about others. Compassion is a common thread too easily lost in the institutional noise. In being overly concerned with who do not belong in ‘our tribe’, we run the risk of losing sight that we all belong to the same, larger human tribe. In all that you do, seek to be just and guide your actions with mercy and humility. In a celebration of the seasonal holidays, trying to remove ourselves from the noise of commercialized consumerism is probably an important thing to try to do. Consumerism can encourage us to concentrate on what we feel ‘we don’t have’. The longer I live, the more I have come to realize a good life is spent feeling enriched by the blessings we already have – and in particular the special connection with those with whom we share love and affection. Especially those family and friends from whom we are separated by distance. We wish all of you a joyous holiday season filled with the bounty of meaningful connections to others. Such a lovely post. Living in Italy as well, we are so relieved to escape the rampant consumerism that has all but ruined Christmas in the US. Looking forward to seeing you soon in Ascoli. It’s so hard to believe that you both have lived in Italy for five years now. It seems like yesterday that you left for your adventure in Ascoli. Thank you for sharing your contemplation on the meaning of Christmas. I, too, feel the loss of the original meaning of Christmas with all the consumerism. Perhaps it’s because I’m older now and thinking back upon my childhood. This year I’m having a “Charlie Brown Christmas”. Beautifully written, Larry. As always with your blog posts, I find much to contemplate…including how quickly time passes! It surprises me that it’s already been five years since you relocated. Sending you and Arlene much love and a wishing you a wonderful holiday season.